Newtown AFC concede their 3rd home league defeat of the season after Bala Town come from 2-1 down to win 2-3 on Good Friday. 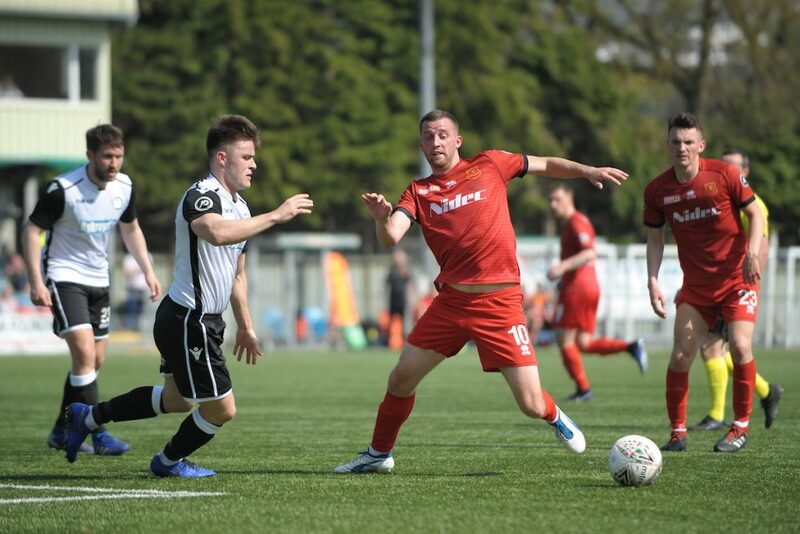 Two goals from Bala’s Chris Venables and a goal from Mike Hayes was enough for the Lakesiders to take home the three points. Newtown’s Steve Leslie and Nick Rushton found the net in the first half but proved to be not enough to avoid defeat. 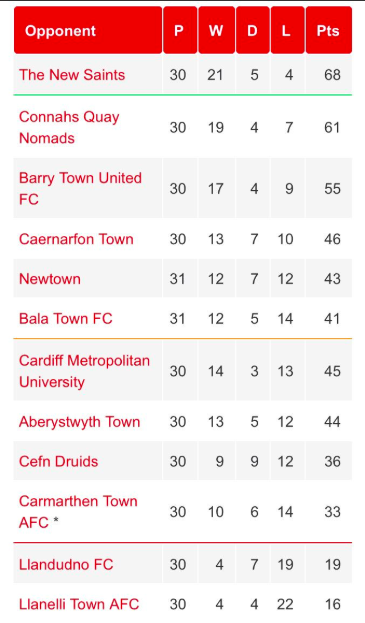 With one game to go in the Welsh Premier League, Newtown remain in 4th place being two points ahead of Bala. 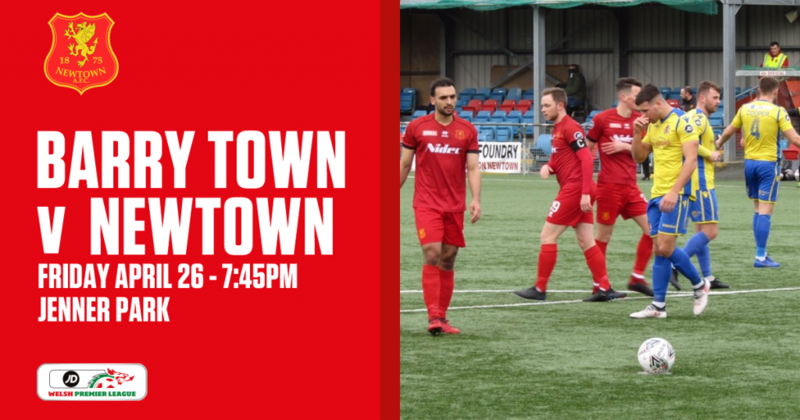 The Robins’ final match of the Welsh Premier League campaign is away to Barry Town United at Jenner Park on Friday night (KO 7:45pm). Newtown manager Chris Hughes made two changes to the starting line-up that lost at Caernarfon Town last Friday night. Callum Roberts and Neil Mitchell returned to the squad as George Hughes and Porya Ahmadi began the day from the bench. The hosts began the game very well within the opening minute as Kieran Mills-Evans headed his effort wide from the edge of the box. With the match being seen as a six pointer, Bala responded quickly to Newtown’s first attack. Christian Seargeant found some space just outside the box before taking a strike at goal which landed in the hands of Dave Jones. But less than 60 seconds later, the visitors opened the scoring from Chris Venables who converted the ball from a free kick. The first few minutes were building this match up to be a classic! And so it showed as the Robins were certainly no push over. Nick Rushton rattled the crossbar with his headed effort. The opening 10 minutes were end to end stuff – nearly similar to the start of Wednesday night’s UEFA Champions League encounter between Manchester City and Tottenham Hotspur. Within the quarter of an hour mark, Rushton went down in the Bala Town box but the match referee Gavin Townsend denied a penalty. At the midway point of the first half, Newtown thought they had their equaliser when Rushton converted the ball home but was disallowed after a foul was involved. But it didn’t matter, the Robins found the net seconds later thanks to a fantastic free kick from Steve Leslie, finding the bottom corner of the net. Then another was added to Newtown’s goal tally six minutes later, Rushton getting on the scoresheet after his disallowed one. 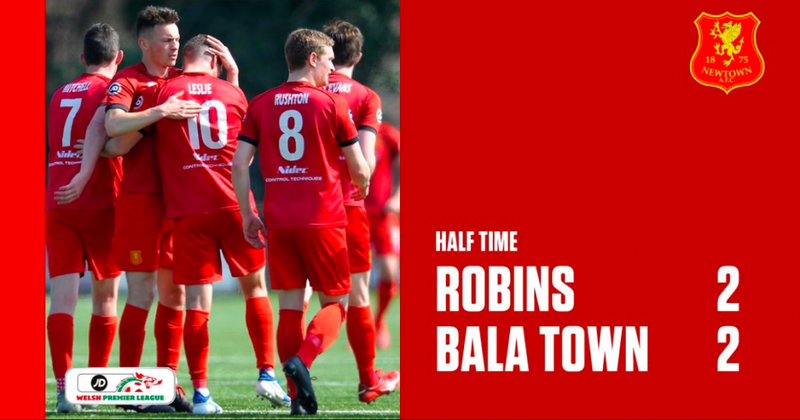 With 5 minutes left on the first half clock, Bala scored an equaliser thanks to Venables yet again by heading the ball in from a free kick. It wrapped up a scintillating first half! Neither side made changes during the half time break and it was the reds that started off well when captain Craig Williams was in charge of the free kick, finding Mills-Evans in the box but his free header went wide. The opening 10-15 minutes after the interval saw Newtown on top in possession. Then on the hour mark Venables was looking to secure a hat trick for Bala when his free header was denied by Jones. Jones then made another heroic save seven minutes later after he eyed up Henry Jones’ long range effort from 30 yards. With 15 minutes left to play, Bala had turned the scoreline around as Mike Hayes calmly placed his low ball shot past Jones. Despite the maximum substitutions made from Newtown in the last quarter of an hour, the Robins couldn’t find an answer to Hayes’ winning goal.